As tax day approaches, I am reminded of that old saw, The only things certain in life are death and taxes. But nobody wants to talk about either of those things, so I thought, as this quarter draws to a close, it's time to check back in with you, Readers, about your New Year's resolutions and goals. I don't really want to talk about that, either. I am here to brag. Why, you ask? First of all, I won. Twice. I won a raffle. The prize is a massage, which I can redeem at the farmer's market when it opens. I also won a gift certificate to a plant nursery by guessing the weight of a boulder. I was at a home show with my friend LL. I was very excited about this contest. I had a feeling when I dropped my estimate in the bowl that I was going to win. Don’t ask me why. I don’t even believe in that stuff. Still, I had a feeling. And I won. I won I won I won. My guess was pretty close—1,967 lbs to an actual weight of 1,948 lbs. In the interest of veracity, I must admit the lady who called burst my bubble a bit, if you can burst a bubble only a bit. Newsflash--you can’t. A bubble is either intact, or burst. So. More like a tire with a slow leak is the metaphor I seek. Leak and seek. Anyway, she told me someone else had guessed a little closer, but every time they tried to contact this person, the person hung up on them before they could speak. This is the tenor of the times, isn’t it? So they moved on to the next closest guess, mine. Of course, I had screened the call, because most calls are not worth answering, then called them back. I am not above hanging up on intrusive calls. Also in the interest of veracity, I must admit that I had to check with my friend LL about the weight of a ton before I could make my guess. But I was right. I am thrilled. Now I can drive 75 minutes to spend $50 on a plant. Or a pot. Or something. I also won by tackling admin. Admin is what gets me every time. Admin is the crap you just don't want to do, but you know you need to do. And life, I am sorry to say, is full of admin. So, after delaying for several years, literally, I finally took the advice of the plumber and called Delta about our kitchen faucet. This required girding myself for hours on hold with customer service trying not to listen to their hold music and for frustrating questions about make and model when I couldn’t find the manual for the thing. And then I called. And miracle of modern miracle, all I needed to do was text a photo of the faucet to the man on the phone, and next thing I knew, he was promising me a replacement part, for free. Still waiting on that, by the way. But—done. Checked off the list. Weight lifted. The ease of that admin left me a bit foolish feeling. I know I am writing backwards. My point is, this kind of detail, this annoying stuff of which life is full, is the kind of stuff I normally walk backwards around the earth in the opposite direction to avoid. The husband and I call this stuff “admin.” This is because I caught a segment of an interview with someone who has written a book about this stuff, which she calls “admin.” And she claims to have strategies to help all of us poor avoidant sods tackle our admin. Unfortunately, I don’t know her name or the name of her book, and while I could look them up by looking on the website of our local NPR radio station, or probably even by googling “book about admin”, I haven’t. So while this information might indeed be very useful for me, and for you, Readers, I do not have it for you. Because finding it is yet another piece of admin. And I used up all my willpower contacting Delta. But, to be successful in life, one must figure out how to conquer admin. As well as how to increase willpower. Apparently, according to this author, some of us are better at admin than others. I am definitely others. So, how to conquer admin? There’s a great piece of advice bouncing around the self-help coaches: Eat the frog. I believe this phrase is attributed to Mark Twain. Again, I would have to look that up, and so I will just lamely assume it is a reference to something Mark Twain wrote. Or said. After all, it seems plausible. He wrote that short story about the celebrated jumping frog of Calaveras County. It’s called, “The Celebrated Jumping frog of Calaveras County.” so it seems plausible he said something about eating frogs. Or it’s plausible that our minds just connect that saying with Mark Twain because he wrote a story about jumping frogs. Frogs and frogs being linked. At least in my mind. I digress. Now, the saying, “Eat the frog,” means to get the unpleasant stuff out of the way first. Off your to-do list. This makes sense. Eating the frog means getting it out of the way and off your chest and out of your mind and off your shoulders. It means you get to cross something off the to-do list. Something unpleasant. However, there is also the advice to conserve your most productive time of the day for your most important tasks, such as your creative endeavors or other projects that require clarity of thought and a reserve of energy. And our most productive time of the day is usually first thing. And they recommend saving the admin stuff for later, when you’re not as primed for creative work. That way you don’t burn energy and therefore willpower on less important tasks. So, which advice is better? Of late, the husband and I have taken to calling everything we don’t much feel like doing, “admin.” Turns out that’s a lot of stuff. Shoveling snow. Changing light bulbs. Planning meals. Admin. Life is full of admin. But I think a secret to happiness is embracing admin. I mean, there is no way around it. So. You know. If you can embrace, as in accept that fact, then you have a better chance at happiness. Admin is the frog. The best scenario is that you partner with someone whose definition of frogs and admin is different than yours. Complements yours, ideally. This is not the case in my home. We have overlapping definitions of admin. Vast, overlapping definitions. In fact, it’s a miracle anything gets done. I can’t tell you how many times the husband claims he’s going to put a letter in the mailbox on the way to work—our mailbox is across the street in a little mailbox house with other mailboxes belonging to the neighbors—and I find the envelope left behind. You’d be surprised how hard it is to cross the street to mail a letter. Or maybe you wouldn’t be surprised. What do I know. I’m just letting you in on the depth of our laziness chez nous. So there are the four quadrants. 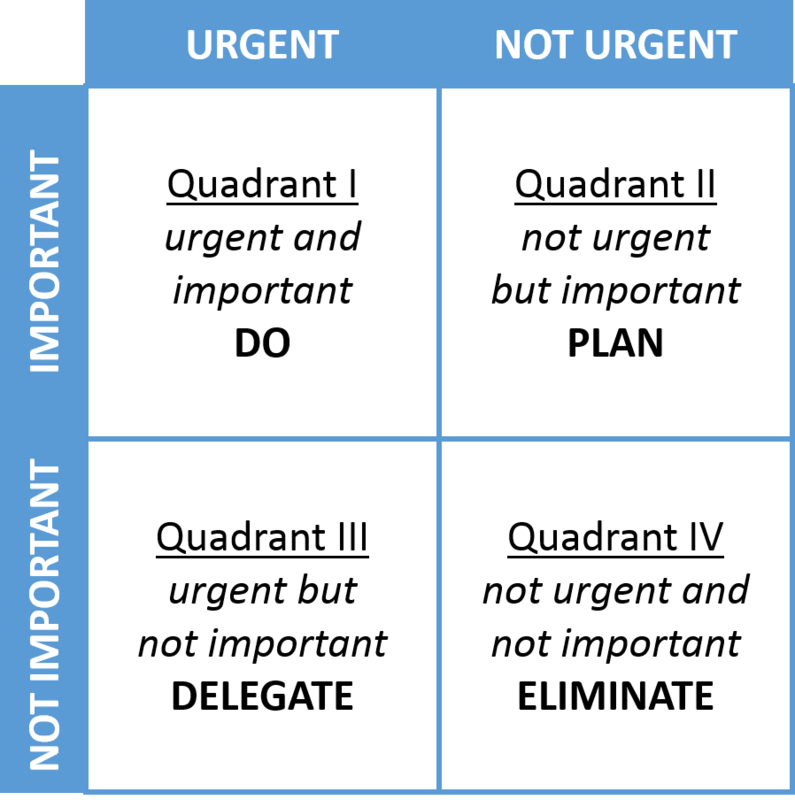 Ideally, you spend most of your time in quadrant II, taking care of things important but not urgent. Here’s where you do your long-term planning, your self-evaluation, your strategizing how best to whatever. This is in the ideal world. In the real world, sometimes it’s all quadrant IV, mucking about with the unimportant and non-urgent stuff. That’s usually followed by a quick (and involuntary) switcheroo into quadrant I, the important and urgent stuff, the crises. After which you have definitely earned a trip back to Quadrant 4 (unimportant and not urgent; online shopping, playing trivia games, whatever.) Although, according to this handy chart cribbed from Stephen Covey, Quadrant IV should be ELIMINATED from your life. I think not. We need Quadrant IV. Probably just a lot less time in it. Honestly, I am not sure which quadrant is the frog-eating quadrant, and Stephen Covey is no longer around to clarify. What I know is that priority-setting, scheduling, and making a plan are three things that make me want to pull the covers over my head and forget. So we can see why I am not a highly effective person. Quadrant III is the quadrant we are supposed to delegate. That’s correct, we are to delegate the un-urgent but important things in Quadrant III to someone else who can take care of them. Hopefully this person will have an affinity for admin. Sadly, since I don’t live in an office, I have no one to delegate things to. I suppose this must be the Eat the Frog quadrant. You have to eat it to get it over with. Unless you can delegate this task to someone else. I’m thinking, which is the Eat the Frog Quadrant? And I’m thinking maybe I need to rename these quadrants. Taxes due today Q2 The place for the Big Boys and Big Girls with Brave Hearts and Minds. Or- Research whom to bribe to get kid into Ivy. Also, which Ivy? Her name is Elizabeth Emens, and her book is Life Admin: How I Learned to Do Less, Do Better, and Live More. Here’s a blog post about her general idea*. Summary: 4 approaches to admin: The Super Doer, the reluctant doer, the admin denier, and the admin avoider (moi). So what was more unpleasant that I had to do? I'll never tell. Instead, I will report that I mailed three important letters this week, which balances out the rebate I failed to earn because I waited so long to send in the form that the offer had expired.